Posted on 12/9/2018, 7:59 am, by kittykill, under Handmade Gift Ideas, Holidays. We tend to forget how magical it is to get a homemade card in the mail. It is so nice to receive something other than bills and advertisements. 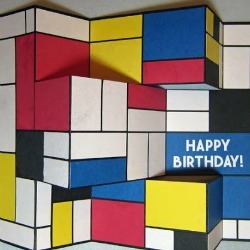 Share your love for ephemera with ceep’s tutorial for a Mondrian Inspired Tri-Shutter Card. This exquisite card may look complicated but the process is easy with a template and a step-by-step guide. You can also use this card as wrapping for gifts cards, cash or tickets to an event. No one will want to throw this beauty into the fire. It will be a keepsake for years to come. Just like people, gifts come in all shapes and sizes. Our Handmade Holiday Gift Guide will help you find the perfect present for that perfect someone.